The 2018 college football season was Jeremy Pruitt's first at Tennessee and his first as a head coach. In the offseason and this spring, Pruitt has shown signs of becoming more comfortable in the lead role and delegating responsibilities to his staff. KNOXVILLE — Jeremy Pruitt isn't asking others at Tennessee to grow and mature without working to do the same himself. Pruitt was coming off five seasons as a defensive coordinator at three other high-profile college football programs — Florida State (2013), Georgia (2014-15) and Alabama (2016-17) — when he was hired to lead the Volunteers in December 2017. He did pretty much what any other coach with no experience heading a program would do. He controlled. He had his hands in everything, to the point one could question how much he truly trusted those around him to do their jobs. Pruitt had successes. He had failures. He had to learn. There have been a lot of staff changes since the Vols completed their first season under Pruitt, going 5-7 to miss a bowl for the second straight year. Pruitt changed both coordinators, bringing in coaches he felt completely comfortable allowing to make decisions. Jim Chaney? He has decades of coaching experience, with plenty of it spent coordinating an offense, something Pruitt has no experience doing. Derrick Ansley? He has years of experience coaching defensive backs in the Southeastern Conference, most recently worked for the NFL's Oakland Raiders and is someone Pruitt believes can truly call a defense. While the Vols won just one more game last year than in Butch Jones' final season, there is evidence of progress within the program. After last season's Orange and White spring game, Pruitt said "some players rose to the occasion and some quit," but with this spring's drills nearly over, effort has not been viewed as a problem. Now more comfortable in the top role, Pruitt has spent most of the practices working with defensive players, but he's not trying to coordinate them as much as provide an extra voice. 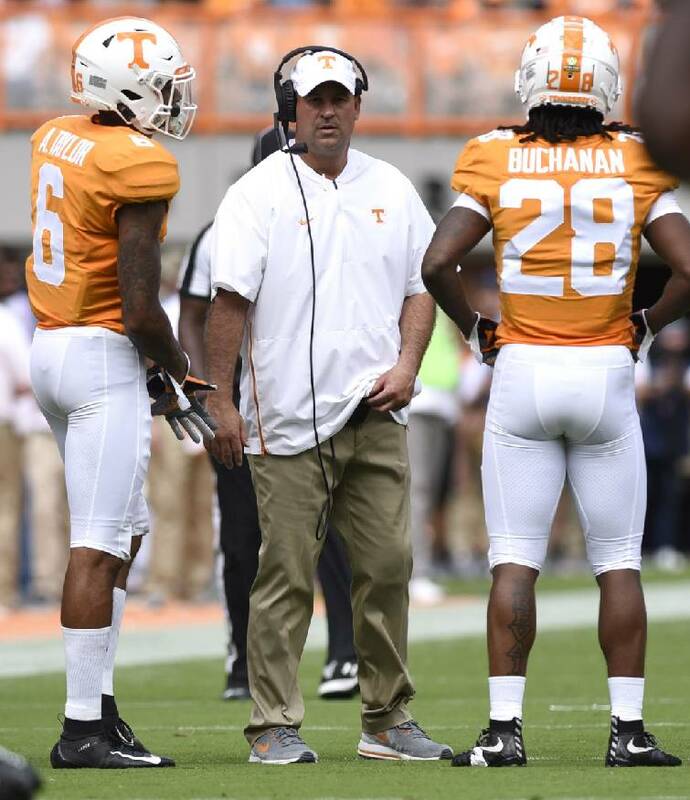 The Vols will close their spring session with the Orange and White game at 6 p.m. Saturday at Neyland Stadium, where players will showcase what they've learned this spring and Pruitt will have an opportunity to show what he learned from last season. "I know it's going to sound crazy, but I see a calmer guy," said outside linebackers coach and co-defensive coordinator Chris Rumph, who worked alongside Pruitt at Alabama early this decade in Pruitt's first stint as a Crimson Tide assistant. "I see a head coach," Rumph continued. "Sometimes, and this is my opinion, I think sometimes when guys come from coordinator to a head coach, I think they try to do everything. They want everything to run the right way. Sometimes they get here to get there and they get spread thin, but I think this year I've seen a relaxed (coach). I've seen a confidence in his staff. I think I see a confidence in the players. I see a star emerging in front of my eyes." Other Vols assistants see the change in the leader, too. They've also seen the difference a year can make in the system, because coaching has become more focused on fundamentals and less about constant instruction compared to last spring. "We all know, listen, it's never easy being a first-time or first-year head coach, especially at a huge program like this," said Vols quarterbacks coach Chris Weinke, who was at Alabama with Pruitt in 2017. "And I think, not to speak for him, but I think he's learned a lot in his first year, just like we all would. He continues to find ways to make sure that we're staying on top of our game in all areas, whether it's schematically, whether it's recruiting. "He's a relentless worker, and I think as he becomes more comfortable as a head coach and spends more time as a head coach, you'll always learn, and I think he's done an outstanding job leading this program. Clearly the vision for the future is very bright here at Tennessee." Contact Gene Henley at ghenley@timesfreepress.com. Follow him on Twitter @genehenley3 or at Facebook.com/VolsUpdate.